Two children discover that they were conceived using in vitro fertilization. Each of their mothers gave birth from the same donor. The married lesbian couple are Nic(Annette Bening) and Jules(Julianne Moore). According to the law one has to be eighteen in order to find their sperm donor. Laser(Josh Hutcherson) is too young to do so. He enlist his eighteen year old sister Joni(Mia Wasilkowski) to help find their biological father. The donor turns out to be Paul(Mark Ruffalo), of whom they make contact. Paul lives a bohemian lifestyle, and looks forward to being a part of their lives. The children are worried about how their mothers will feel about Paul. When they do find out, Paul is invited to dinner. Jules tells Paul about her landscaping business, and Paul request that she design his backyard. Nic doesn't approve, thinking it's not a good idea. The job turns into an affair between the two. Jules is encouraged by Paul, whereas Nic is non-supportive with her work. A relationship develops with Paul, Jules, and the children. Paul goes against the grain with Nic. A huge fight breaks out between Jules and Nic, because of Paul. After a while, Nic determines something is going on between Jules and Paul. She confronts Jules, and Jules eventually admits to the affair. The children are upset when they find out. Paul attempts to lure Jules away from Nic, but she declines. Paul comes to their home trying to convince Jules of their relationship. Nic tells him to go make a family for himself. The children reject him, and he leaves. That night Jules begs the family to forgive her as she admits what she had done. The family all take Joni to college the next day. On the way home Laser tells his mothers that they belong together, and should stay together. Jules and Nic are holding hands smiling when the film ends. 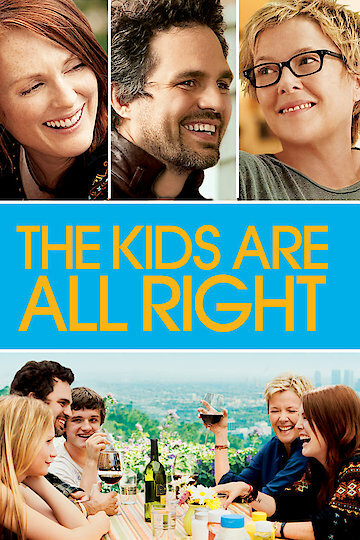 The Kids Are All Right is currently available to watch and stream, download, buy, rent on demand at Amazon Prime, Starz, FlixFling VOD, Amazon, Vudu, Google Play, FandangoNow, iTunes, YouTube VOD online.